There are instances when you want to update a space, but cannot undergo major renovations to make the space reflect your personal design tastes. 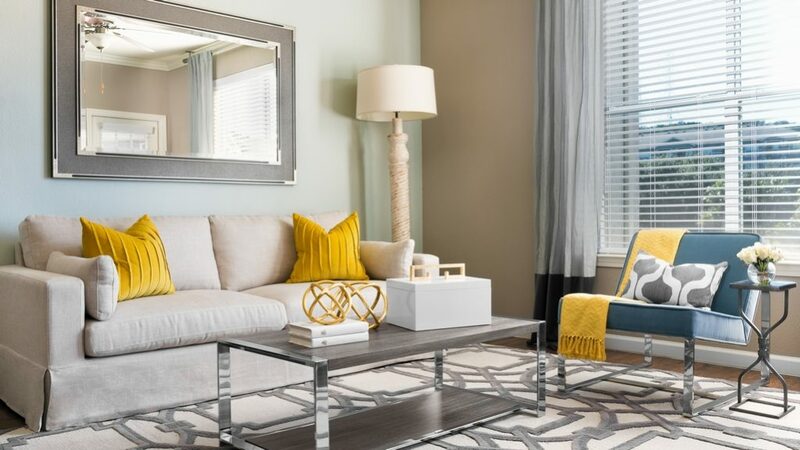 If you are renting your home, updating an income property, or simply do not have the budget to undergo construction changes, furnishings and decor can make all the difference in a space. 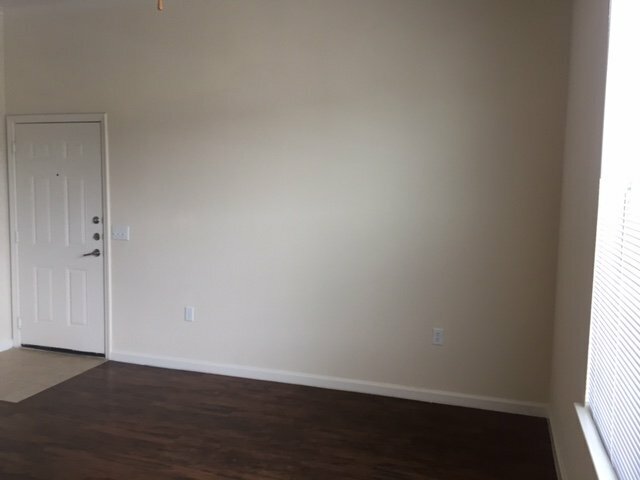 In this particular project, we were commissioned to transform a model apartment for a multifamily community in San Antonio, TX. 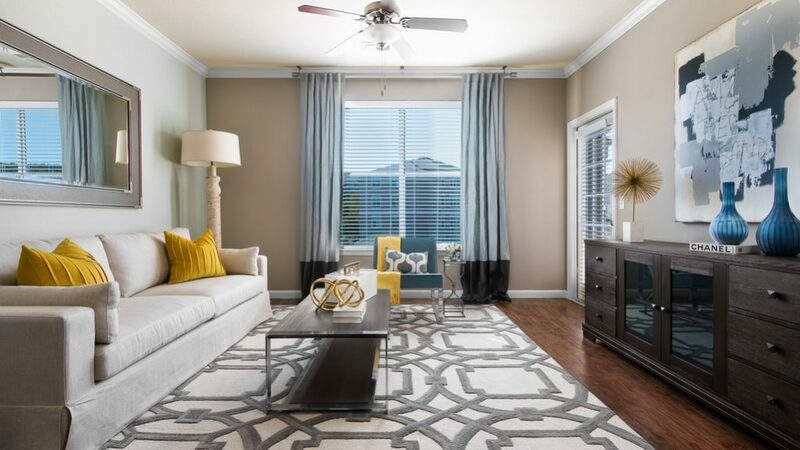 Since the model is supposed to serve as an example of what an interested renter can expect from the community, the only elements that were updated were the furnishings and decor. Here’s a look at the process. The space was a blank canvas and the budget for the space was conservative. There were dark wood floors and the kitchen had dark granite countertops and wood cabinets. We wanted to select stylish, yet memorable pieces that would make this property’s model stand apart from the rest. Apartments are typically scarce in space and lend themselves to a more minimal design. To make the most of the space, we used a palette of sharp yellows and soft grays to give the living room depth and interest. We incorporated a skirted sofa with a deep frame as one of the anchors of the room. It pairs nicely with a large-scale geometric print rug in grey and ivory. The large media cabinet adds another focal point to the space. Colorblock draperies frame the window nicely and give the model apartment a cozy, intimate vibe. We always recommend incorporating some sort of window treatment into a space. It adds a soft layer and makes a room feel more finished. Custom draperies are ideal, but if that is not an option there are stylish ready-made options available. In this particular project, we mounted the draperies from the ceiling to get as much drama from the panels as possible. Colorful accents are brought in with pillows, art, and decor. A large mirror over the sofa creates the illusion of a larger space. A coffee table and chair with chromes details give the space a bit of a modern edge. If you need help transforming a space, let our award-winning team help. Start with our questionnaire. For more examples of our Commercial projects, visit our portfolio. As a reminder, we will be closed next Friday, April 19th for Good Friday. We will reopen Monday, April 22nd.